ON SUNDAY 12TH MAY. RECEPTION AT 6.45PM. Tickets for the Dinner are £125 per person. We are asking people to sponsor a table of ten for £3,000. We will also celebrate the ordination of our new rabbis this coming July into the Progressive community alongside the two ordained last July. For more information please email dinner2019@lbc.ac.uk or call Juliet Moss on 020 8349 5604. 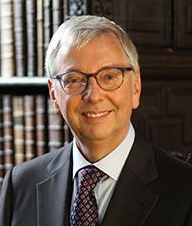 Our guest speaker will be Professor Stephen Toope, Vice Chancellor, University of Cambridge. This will be gift aided. Giftaid is not applicable on tickets and advertising. Would you like us to contact you about future events? Would you like more information about leaving a legacy to Leo Baeck College?